Note: You can enter this giveaway one (1) time per e-mail address per day. Deadline is 11:59PM ET 3.2.19. One pot, one recipe, one complete meal. 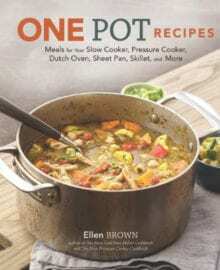 Ellen Brown shares 100 easy to make, delicious to eat, and then super easy to clean up. Most meals include a protein, vegetables, and legume or starch, it’s all there. With a variety of methods you can find a recipe that works in your kitchen and with the equipment you own, including recipes for the Instant Pot, slow cooker, skillets, Dutch oven and sheet pans. Heat things up with spicy southwest shrimp, comfort with a soul satisfyingly rich boeuf bourguignon, and delight with tender and flaky baked salmon with couscous. Braised greens with andouille are a hearty and unbelievably tasty way to eat your veggies. Good to the last drop. To make sure you’re kept abreast of our latest giveaways, subscribe to our giveaway-only feed. If you want to stay on top of our recipes and writings, subscribe to our general feeds, e-mails, or digest in the column to the right. Visit our FAQs page, if you have questions. NO PURCHASE NECESSARY TO ENTER OR WIN. Void where prohibited by law. Open to legal residents of the 50 U.S., D.C. and Canada (excluding Quebec) who are at least eighteen years old at the time of entry and have internet access. Begins on 2.9.19 at 12:00 a.m. ET and ends on 3.2.19 at 11:59 p.m. ET. To enter this giveaway, submit your full name and email address on this form. Odds of winning this giveaway depend on the total number of eligible entries received. Only one (1) entry per email address per day. Sponsored by Leite’s Culinaria, Inc. For more information, visit our Official Rules. For a list of winners, check out our Very Happy Winners page. Be sure to add giveaways@leitesculinaria.com to ensure notification if you are the winner.